Perhaps the largest and certainly the most photographed art event in the City of Tacoma has now ended. October 31st, marked the 30th Frost Park Chalk Off episode. Andrea, RR Anderson, and Stowe were tied for first place with 5 wins each. Stowe prevailed last week with a portrait of Larry Frost, for whom the park was named, securing his 6th win at Frost Park winning the series. Thus, James Stowe is the Greatest Illustrator in (the universe of) Tacoma. I am the Greatest Illustrator in the Universe (of Tacoma)!?!? Acceptance speech? Sure, why not... I got the title, who is going to stop me? So, Who would have thunk it. Honestly, I had my money on another horse. First let me say thank you to everyone who voted for me and everyone that came out to the Chalk-Offs and Feed>>Tacoma each and every week. I have gained much more than I thought possible when I first decided to go down to the Park that 3rd Episode in... what was it... April? Since then I've gained friends, collaborators, conspirators, an artist mentor (or two) and a re-prioritized drive to work in Tacoma for Tacomans. Thanks to Frost Park I've done art festivals, art auctions, artist tours and I've gained access to one of the most unique studio spaces in the city. I've been contracted to create art by the city, a local poet, a certain home town internet company, City Arts magazine, an Izenmaniac and the best hot dog selling, beer slinging neighborhood bar I've ever stepped foot in. I've been on UTube. I've been invited to contribute to a Beautiful Angle poster. I am a founding member of a secret clandestine underground cartoonist society (a personal life goal). I've put on an Art Show (deemed surprisingly somewhat successful). After all that I actually managed to pull off becoming the Greatest Illustrator in the Universe (of Tacoma)... with a back to back late season comeback no less. Oh, and Frost Park helped me loose 120 lbs. I am literally a different person now than I was 7 months ago. So thank you R.R. Anderson. Thank you Joe Izenman. Thank you Erik Bjornson. Thank you Kevin Freitas. Thank you Andrea, Dawn, Adam, Mark, Lisa, Elliot, Lance, Jeremy, Ariel, Joel, Andrew, Dave, Chalk Ringers and Junior Chalk Enthusiasts. Thank you sponsors (especially the Noglers, Courtney Stowe, Embellish Salon, Laura Hanan, the UrbanXChange and Electric Elliot). Thank you ZOMBIES (you know who you are). And thank you to everyone I've missed. I will not take my duties as the GITU(OT) lightly. I will continue to produce Art and Illustrations for Tacomans that Tacoma can be proud of. I will celebrate my city and never put her down. I will always play with chalk. And be ready... for next Spring you will have to pry my title from my cold, dead, chalk stained claws. See everyone at Frost Park next year. Or maybe sooner. by morgan on 11/3/2008 @ 8:41am Well done Stowe! Thank you and all the Chalkies for adding some life to the city this season. Tacoma is lucky to have you! I can't wait for the second season. by Erik on 11/3/2008 @ 10:57am I can't wait for the second season. The chalking level will likely start up at the place it left off. by izenmania on 11/3/2008 @ 11:00am Proposal: next chalking season to begin April 3rd (first Friday in April). That once again gives us 30 Fridays until October 30th. by izenmania on 11/3/2008 @ 11:01am Oh, and also: congratulations, Mr. Stowe, on each of your accomplishments, artistic, professional and personal, over the course of the chalking season. Well deserved on all fronts. by ALT on 11/3/2008 @ 12:08pm Congrats again Stowe! I too share your sentiments about RxR's Chalk Challenge brain child; It has been an amazing vehicle for both community inspiration and for bringing attention and job opportunities to little known local artists. 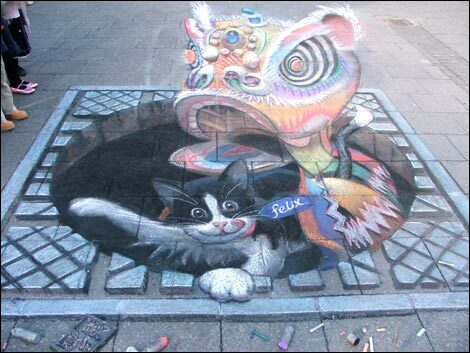 The Chalk Challenge has also revealed to many the work that goes into creating art, increasing appreciation for finished work. It's also created opportunities for local photographers and videographers. It's been an all around fantastic ground for networking with all kinds of creative people! Without you though, Stowe, I don't think the Chalk Challenges would have been near as exciting as they have been. Comic covers, collectors cards - you brought local art to a whole new level of excitement and inclusiveness. Congrats again! You absolutely deserve it. by Girl Who <3 JUNK on 11/3/2008 @ 1:45pm Hip--Hip HURRAY! You go you incredible shrinkin chalkie you. by jenyum on 11/3/2008 @ 2:45pm Congratulations Stowe! by Crenshaw Sepulveda on 11/4/2008 @ 10:53am It is "Frost" park, shouldn't there be a special winter time chalking event at some point in time? by Erik on 11/4/2008 @ 12:39pm It is "Frost" park, shouldn't there be a special winter time chalking event at some point in time? by Dave_L on 11/4/2008 @ 12:41pm CS with yet another good observation. I bet there will be some scattered off-season maverick chalking. Congratulations, James. You are an inspiration in many ways, my friend. BTW, in a follow-up to your City Arts work in the last issue, thereâ€™s a nice letter-to-the-editor in this current November issue about you, zombies, and last month's issue (along with poignant writing by fellow chalkie Jessica Corey-Butler and a nice article on advice to local artists). It will be fun to see how the next chalk season will evolve and what new ways it can benefit our community. I love James Stowe's illustration in your article on Day of the Dead ("La Vida Eterna," October) - and his simultaneous cameo in your City Seen section. I wish I could be known as a zombie expert in my community! I have actually seen Black Sheep, the film about zombie sheep he references in your interview. Major gore. I don't recommend it for the kids, unless you want them to be put off trips to the petting zoo forever. Seriously, though, City Arts is doing a really nice job of giving ample pages to local talent that I might not otherwise discover. Keep up the good work. Okay, that is an awesome ed letter. I was very happy with my spread and my zombie expert status. I hope I can do more City Arts work in the future, they were great to work with. And thank you everyone for the heartfelt congrats! Pay no attention to Erik. He's full of it. I'll certainly continue going to the park as many Fridays as I am able, and I encourage others to do the same. And I encourage them to bring chalk if they do so. Erik loves pointless rhetoric for rhetoric's sake, and so he has made a big deal out of it being THE END. The only thing that is going on hiatus is the competitive aspect. For a while, we will just be hanging out, drawing if we feel like it, without winners and losers and prizes and post after post after post after post of hype on the feed. by Erik on 11/4/2008 @ 1:33pm Erik loves pointless rhetoric for rhetoric's sake, and so he has made a big deal out of it being THE END. Just the opposite izenmania. Look again for the hidden meaning, a treasure trove for the seeker. Don't count winter out for Frost Park. I suspect there may be something more happening there than laxidasical eating and chalking.